Growing up, my mom would make this casserole for us all the time. It is packed with flavor and delicious ingredients. The ground beef adds some heartiness to the meal. I am obsessed with feta and love how it compliments the Greek seasonings of the dish. 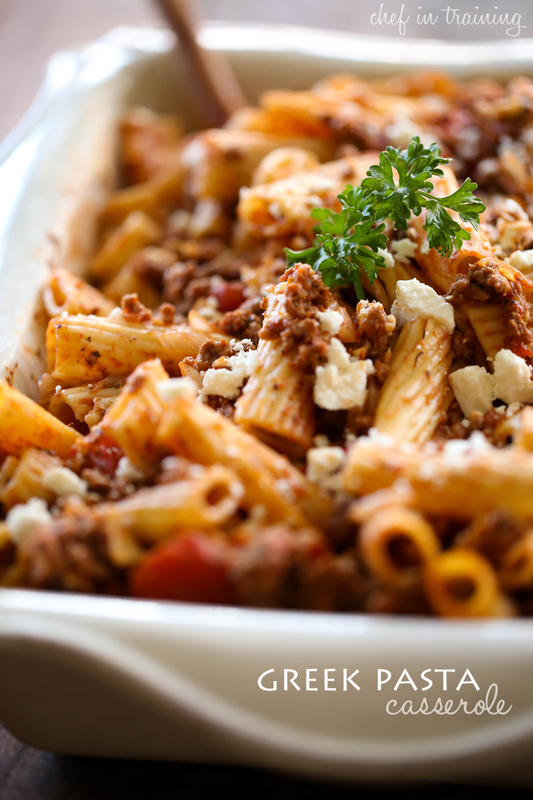 This Greek Pasta Casserole is filling and tasty. It will quickly become a family favorite just as it has for us. I grew up eating casseroles like this. Totally family-friendly, makes a ton, planned leftovers, and hearty! Perfect fall and winter food to keep you all warm and cozy! Pinned! I love easy casserole is to throw together, and I love all the Greek flavors in here! So yummy. Looks incredibly hearty and filling-which is exactly what I want this time of year. I made this recipe last night and it was absolutely FABULOUS! So easy and delicious. My husband loved it too. I added extra feta because I just love Feta! But I really enjoyed cooking it and thank you so much for sharing this simply amazing recipe!